Image: Allen Discovery Center at Tufts University. By leveraging the regenerative powers of migraine medication, researchers at Tufts University have restored the vision of blind tadpoles after grafting eyes to their tails. Sounds bizarre, but a similar technique could one day be used on humans. A new study published in npj Regenerative Medicine shows that eyes, and probably other sensory organs, don’t have to be attached directly to the brain in order to function properly. What’s more, a drug typically used to treat migraine headaches, Zolmitriptan, boosts the body’s ability to foster nerve growth—at least in amphibians. Previous work has shown that functional eyes could be grafted in blinded tadpoles, but the new research shows its possible to use drugs to improve the efficiency of the process. The researchers are hopeful the finding could improve the success of biological implants in humans. In experiments, biologist Michael Levin and his colleagues at the Allen Discovery Center at Tufts University showed that blind tadpoles could regain their vision after having eyes grafted to their tails, and after receiving a dose of the migraine medicine. The molecules in this drug boost an important biological process called innervation, in which nerves are supplied to specific parts of the body, by activating a pair of serotonin receptors associated with neural development. Going into the experiment, the researchers were hoping to learn more about how the nerves of re-grown or transplanted tissue integrate and form new connections after transplantation. When innervation is weak, sensory organs are prevented from communicating auditory, visual, or tactile information to the brain. Knowing in advance that Zolmitriptan boosts neural growth, the scientists wondered if it might contribute to innervation. To find out, the researchers grafted a single eye onto the tails of 38 blind tadpoles (the tadpoles had their eyes removed when they were just three days old), and then administered the drug to the transplant site. 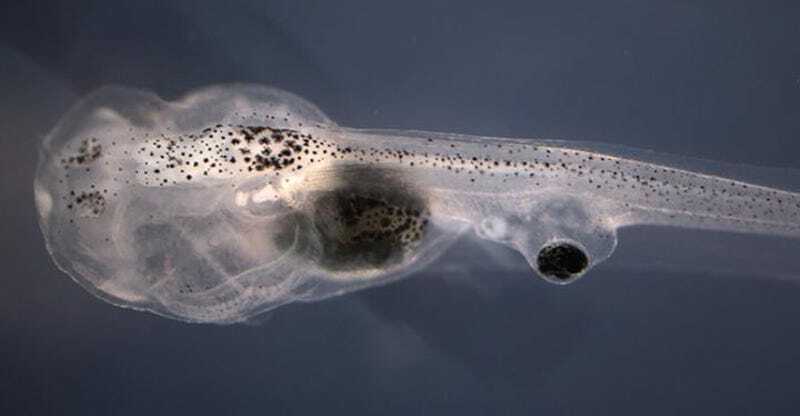 After four days, the neurons within the implanted eye began to grow and latch on to the tadpoles’ central nervous system. Eight days after the grafts, 40 percent of the tadpoles who received the drug grew neurons that reached the central nervous system, and without any detrimental effects. In tests involving color and visual acuity, the tadpoles who were treated with Zolmitriptan dramatically outperformed their blind counterparts who had transplanted eyes but weren’t given the drug. Given these findings, the researchers say the drug could eventually be used in regenerative medicine to foster innervation, thereby increasing the success of transplanted organ functionality. The freaky result also shows that sensory organs can still work when they’re not attached directly to the brain. “If a human had an eye implanted on their back connected to their spinal cord, would the human be able to see out of that eye? My guess is probably yes,” commented Michael Levin in New Scientist. It’s doubtful that someone would want to place an eye or an ear on their neck or their back, but stranger things have happened. More practically, the technique could be used to facilitate other types of biological implants, such as bioengineered organs, tissues, and limbs—from bladders, hearts, and tracheas through to eyes, ears and sensitive skin. Consequently, this new work suggests that scientists can get more ambitious in their thinking and consider more radical transplants.